Welcome to my blog page, for I am so pleased to have you here with me. As you may know, I am a Sister of Charity from Emmittsburg, Maryland. This month, our group was selected to aid in the nursing of soldiers for the Confederates in the Civil War. The earliest nurses in the Civil War were all sisters, with the occasional soldier's wife. I am so blessed to be able to serve these men as they fight and become wounded. My simple training will help us greatly treat the wounded when they arrive. 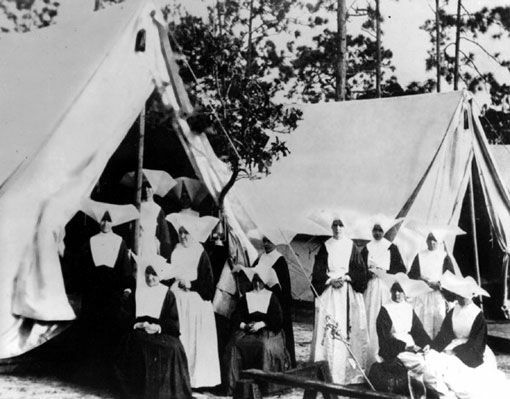 Some of my fellow Sisters were sent to Richmond, Virginia to assist in the Stuart Hospital for the Confederacy. Others, however, remained in Maryland and may be stationed in other local areas, potentially Frederick, Maryland. This war is such a shame, for there are so many wounded on both sides and who knows how long the war will go on. President Lincoln and President Davis both are very gracious for our efforts in the War thus far. We, as a group, are honored beyond belief for the ability to help both the Union and Confederacy in the War as best we can. I hear that they are going to begin asking for volunteers for the nursing staff in the months to come. The name Dorothea Dix has floated around our field hospitals and the Sisters in Richmond, Virginia have written letters mentioning her efforts to recruit more nurses. I pray that she is able to increase the number of nurses greatly, for there are many men in areas not being cared for due to the shortage thus far of nursing staff. I look forward to writing again as soon as we are less busy. I heard some gunfire from a distance, so I will be going now. Wishing you the best. My name is Sister Elizabeth Smith and I was a nurse in the early Civil War. I was part of the group of Catholic sisters who received training to be a nurse prior to the War. I am a nun for the Sisters of Charity in Emmittsburg, Maryland.